The Pixar animation about a rat who wants to be a chef is pretty good as long as you think of it as an American rat and characters playing Parisians. Close but not close enough. It has some scenes that seemed too much designed by committee but overall, the story felt really good. And the animation was great. At the end, they had a sticker claiming "100% Genuine Animation! No motion capture or any other performance shortcuts were used." Not sure it matters. Not sure anyone but a few traditional animators would care anyway. And I'm not sure if I were at Pixar that I'd want to be the guy who said we'd NEVER use motion capture or any other method to make the film better. Going on a long airplane ride lets you watch a bunch of films. On the way to Taiwan I watched Lookout and Meet the Robinsons. On the way home I saw Astronaut Farmer, Shooter, and the Last Mimzy. In the limo to/from the airport, I watch Cellular and Pi. Meet the Robinsons is an animated film about a young inventor and his future family. Cute. Astronaut Farmer is a brilliant film about following your dreams -- even if that means building your own rocket and launching yourself into space. Shooter is a rather bad action film about a sniper and a conspiracy. The Last Mimzy is about a toy rabbit that makes two kids really smart and somehow they end up saving the future. In Cellular, a young man receives a desperate call on his cellphone from woman claiming to be kidnapped. This leads to some dramatic chases and action sequences. Pi is about a paranoid mathematician searching for a key number that will unlock the universal patterns found in nature. Chased by stock pickers and a Jewish society looking for the true name of God, he chases down the answer (not 42). 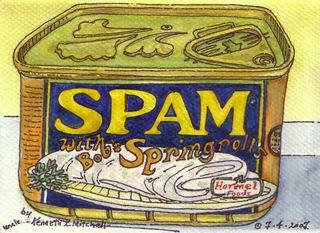 Uncle Ken painted a Can of Spam for me to celebrate the 2007 Del Mar Fair Spam Contest victory. Thanks! Out walking the dog tonight after hearing some day early fireworks from Mission Bay. We sat to watch on the alley north of Coronado off of Froude. And I hear some scuffling noise after a bit. I turn on the flashlight and there's a skunk within arms reach. The dog and I dash off into the street. The skunk dashes down the hill. Tender yelps. I figure she's been sprayed. But no, the drama queen has the leash between her legs. She doesn't like walking when this happens. We go to the other side of the street to watch the last five minutes of the show. Tomorrow: 9pm off the ocean beach pier and 9:30 at Sea World. I suspect traffic will be bad until 11pm or so. Cygnet presented Arcadia by Tom Stoppard. The play talks about mathematics (fractals and chaos theory), physics, interpretation of history, madness, love, and the poet Byron. Rachael VanWormer (one of our favorites) plays Thomasina Coverly, a brilliant mathematician at the age of 13. Interweaving two different eras (1809 and 1989) in the same house, the play is both clever and interesting. I liked it, Sophia wasn't that enthusiastic.